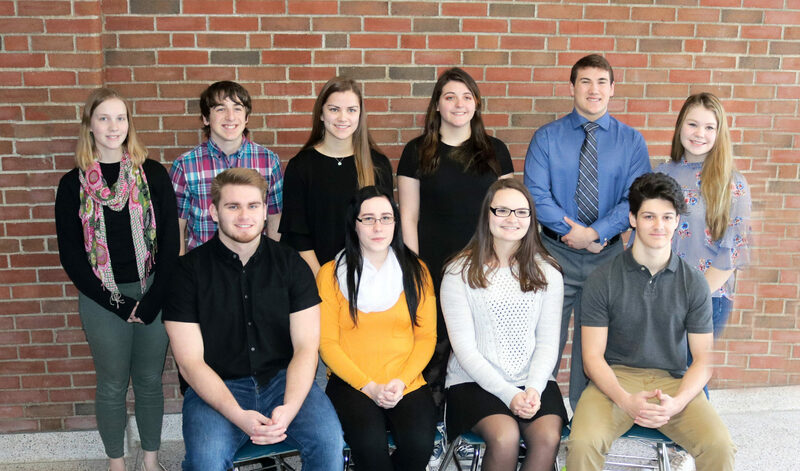 Gowanda Central School District has announced the Top 10 members of its Class of 2019. Congratulations to these outstanding seniors who have succeeded academically and athletically. Valedictorian Samantha Kinnaird. Activities and interests: National Honor Society, AP Art. Her favorite high school memory is Playing tennis ball thunder and winning on the last throw of the game. Her advice for upcoming seniors: “Wake up every morning and make your bed. If you can accomplish one goal, all the others will fall at your feet.” She plans to study nursing at the University at Buffalo. Samantha is the daughter of Barbara Kinnaird and Margaret Oleksa. Salutatorian Kasie Salzman. Activities and interests include: softball, managing cross country and being in the high school play and musical. Her favorite high school memory is her first time at the McQuaid Invitational. Her advice for upcoming seniors: “Don’t let what other people think of you get in the way of reaching your goals.” She plans to attend the Honors College at The State University of New York at Brockport for Biology. Kasie is the daughter of Jamie Watkins and Kevin Salzman. Ceili Lipp. Activities and interests: Band, swimming, Quiz bowl. Favorite high school memory: Swim senior night. Advice for upcoming seniors: “Put 100% of yourself into what you are passionate about and it will show.” She plans to attend RIT for micro electronical engineering. Ceili is the daughter of Joseph and Heather Lipp. Tyler Dakin. Activities and interests: Quiz Bowl, Student Council, iOS development. His favorite high school memory: “I don’t really know of one memory that stands out, but the people I’ve been around since freshman year have given me the best memories.” His advice for upcoming seniors: “If you’re feeling unmotivated, find an activity you’re passionate about that will motivate you.” He plans to attend college to study computer science. Tyler is the son of Dan and Christine Grande. Olivia Ackley. Activities and interests: Volleyball, lacrosse, all-star cheerleading, National Honor Society and Spanish Club. Her favorite high school memory is making it to the section finals for lacrosse. Her advice for upcoming seniors: “Continue to work hard, it’s only one more year.” She is planning to attend college and major in physical therapy. Olivia is the daughter of Dan and Amy Ackley. “Just pay attention you’ll be fine.” He plans to attend Grove City College, Majoring in Biology and General Science and Education, Biology Teacher. Andrew is the son of James and Brenda Musacchio. Grace Pawlak. Interests and activities include volleyball, cheerleading, lacrosse, National Honor Society, Spanish Club, SADD, Model Office, Pep Band, traveling, youth cheer coach. Her favorite high school memory is making it to section finals for lacrosse and volleyball. She plans to attend St. John Fisher College for Nursing. Her advice for upcoming seniors: “Go to every event possible.” Grace is the daughter of Robert and Charity Pawlak. Justin Kohn. Activities and interests include football, basketball, baseball, National Honor Society, STEM Academy and SADD. His favorite high school memory is playing at Coca Cola Field and at Cooperstown for baseball. His advice for upcoming seniors: “Begin to plan for post-graduation ASAP It’ll be here before you know it.” He plans to attend The State University of New York at Fredonia. Justin is the son of Scott and Jessica Kohn. Ryan Gernatt. Activities and interests: football, wrestling, lacrosse, class president of the Class of 2019, NHS Vice President, weightlifting club, ski club, school store. His favorite high school memory is being selected for WNY All-Academic Team and 1st Team All League for both football and lacrosse, as well as playing at Hillis Field under the lights on Friday nights. His advice for upcoming seniors: “Take college classes and challenge yourself. Be involved in the community and give back to those you owe debt.” Ryan is the son of Nicolas Gernatt and Jennifer Gernatt. Brooke Riedel. Interests and activities include SkillsUSA, being Student Council secretary, National honor Society, National Technical Honor Society. Her favorite high schoo memory is making close connections with a lot of her teachers. “Each one helped me in different ways and I appreciate GHS teachers immensely.” Her advice for upcoming seniors: “Appreciate your last year. It’s going to be gone in the blink of an eye.” She plans to attend the Niagara Falls Culinary Institute for Baking and Pastry Arts. She is the daughter of Laura Hill. Caption: These top-ranked seniors are graduating at the head of the Class of 2019 at Gowanda High School. Front: Andrew Musacchio, Samantha Kinnaird, Kasie Salzman and Justin Kohn. Back: Brooke Riedel, Tyler Dakin, Olivia Ackley, Ceili Lipp, Ryan Gernatt and Grace Pawlak.